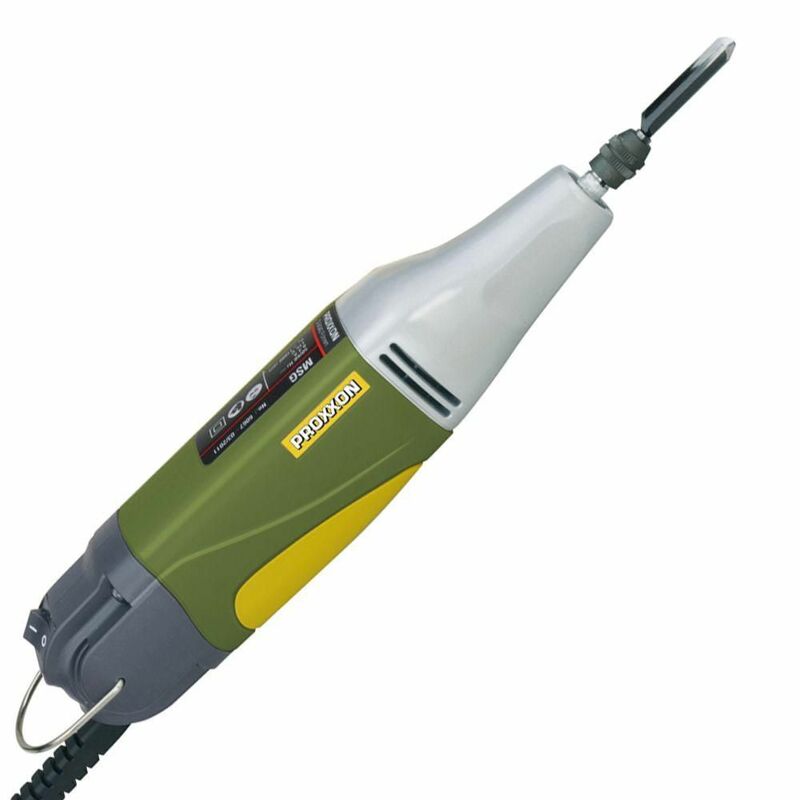 The Proxxon Power Carver is suitable for carving of all types of wood. Can be used for carving and the restoration of furniture. This carver is ideal for taking the work out of your carving projects. Excellent for cutting curves and compound angles, 00 to 450 square tilting table. Laser guide system indicates the cut line for reliable cuts every time. Hinged doors for quick access to blade. Has built-in brush to clean the drive wheel during operation. Comes with blade, miter gauge, rip fence, work light and light bulb. Variable speed thumb dial (8,000 - 30,000 RPM). Ideal for all your sanding, grinding, sharpening, polishing and cutting needs with its Soft non-slip rubber grip housing. This 135 pc. accessory kit comes with assorted accessories, 40 flex shaft, height adjustable stand with adjustable clamp, collet nut adjustment key and sturdy carrying case. The Proxxon Jig Saw STS 12/E offers fantastic cutting capacity with a balled foot or flat footplate. The full wave electronic speed control allows for consistent power and cutting force throughout the variable speed control range. This tool is ideal for cutting tight curves in wood, non-ferrous metals, and plastics including round surfaces. Power Carver MSG with Storage Case The Proxxon Power Carver is suitable for carving of all types of wood. Can be used for carving and the restoration of furniture. This carver is ideal for taking the work out of your carving projects. Power Carver MSG with Storage Case is rated 4.7 out of 5 by 7. Rated 5 out of 5 by Richard from The carver works well. It is easy to use... The carver works well. It is easy to use and seems well made. On the other hand, I’ve only had it for two weeks and I have no idea how well it will do over time. Reviews for products like this ought to be done after you have used it for several months. Rated 5 out of 5 by Happysofar123 from So far I'm very satisfied wish the power carver. It feels great, it has run great and it has file... So far I'm very satisfied wish the power carver. It feels great, it has run great and it has filed a space in my tool bin. I'll know more about the durability after I've used it a couple of months on different projects. Rated 4 out of 5 by Gee from The Proxxon Carver performs as advertised! It's quite loud, so... The Proxxon Carver performs as advertised! It's quite loud, so wear hearing protection. It seems pretty solid. Rated 4 out of 5 by schmo from carver works well.....have used it on 2 projects so far and I was happy with the results. I am ... carver works well.....have used it on 2 projects so far and I was happy with the results. I am not so happy with the chisels that come with it -- they don't hold an edge very long. Will be looking to upgrade to better ones very soon. Home Depot was the best price I found on the market AND I was able to get free shipping on this particular order....very nice!! I would recommend this product and recommend ordering from HD. Rated 5 out of 5 by Poolboy from great tool for carving lots of choices for bits to create some unique shapes. Works great with pine, cherry, oak, poplar. Get your creative energy on! Rated 5 out of 5 by Carver from Great for rough in and smaller carving projects! As a professional woodcarver my tools are carefully researched and selected. I chose this unit to add to my reciprocating tools. It is an excellent machine. Light and rugged. It accepts Flexcut gouges without having to use shims. I recently used it on an oak cabinet I built and carved for a customer.